PhD student, Sarah Asebedo, CFP® and Martin Seay CFP®, assistant professor, won the Financial Planning Association’s (FPA) 2016 Montgomery-Warschauer award for their November 2015 Journal of Financial Planning article, “From functioning to flourishing: Applying positive psychology to financial planning.” Each year, the Montgomery-Warschauer award recognizes the paper deemed to have provided “the most outstanding contribution to the betterment of the [financial planning] profession.” Congrats to Sarah and Martin on this outstanding accomplishment! The K-State Personal Financial Planning, PFP, program was nominated for, and won, the Association for Continuing Higher Education’s, ACHE, 2015 distinguished credit program for the program’s originality in serving a unique audience and unique delivery system approach (additional info on page 11) last November in St. Louis, Missouri. Cole Foster is a personal financial planning major with a minor in business. 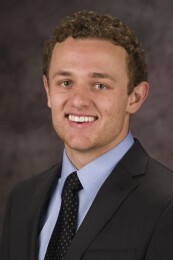 Cole was co-president of the K-State Financial Planning Association and developed two unique fundraisers to benefit the local community. He was a member of a team that won the Financial Planning Association’s national financial planning competition in 2015. Cole spent two years as a lifegroup leader with Christian Challenge and is the recipient of the College of Human Ecology’s outstanding senior award for leadership. 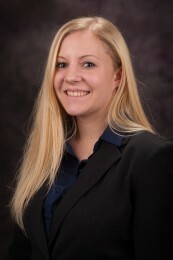 Miranda McMahon is a personal financial planning major with a minor in business administration. 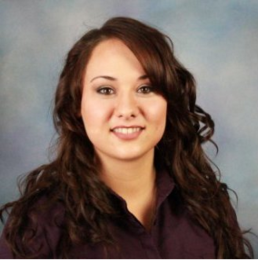 Miranda was a member of the Financial Planning Association, K-State’s Financial Planning Association and the Professional Advantage Program through the College of Business. She is a peer counselor and a member of the Student Advisory Council for Powercat Financial Counseling. Miranda volunteers her financial expertise at Shepard’s Crossing, a local nonprofit and is the recipient of the College of Human Ecology’s outstanding senior award for engagement. Hannah Rice is a personal financial planning major with a minor in business. Hannah has conducted research with faculty and a doctoral candidate regarding the integration of physical and mental wellness with money and finances. With this research, Hannah coauthored a chapter in a health and wellness book, WholeFIT: Wellness for Life. She was a member of a team that won the Financial Planning Association’s national financial planning competition in 2015, which took over six months of preparation. Hannah is the recipient of the College of Human Ecology’s outstanding senior award for research and creative scholarship. Sevda Tasci is a personal financial planning major with a minor in business. 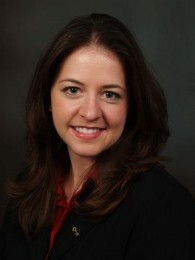 She is a member of the Financial Planning Association, the Association for Financial Counseling and Planning Education, the Society of Financial Service Professionals and has served as president of K-State’s Financial Planning Association. Sevda has participated in the College of Human Ecology’s professional mentoring program and is a recipient of FSP’s Excellence in Financial Education Award. 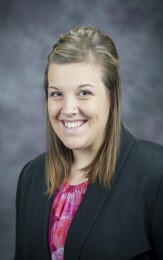 She received the College of Human Ecology’s outstanding senior award on the K-State Polytechnic campus. Cole, Miranda and Hannah are May 2016 graduates and Sevda will graduate in December 2016, all with bachelors of science degrees in personal financial planning. We’re excited to see where they go as they begin their careers! The personal financial planning student team earned first place in the 2015 Financial Planning Challenge. The competition included eight teams and was held September 24-28, 2015, in Boston, Massachusetts. 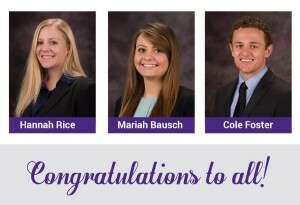 The student team consisted of seniors Mariah Bausch, Cole Foster and Hannah Rice, advised by Ann Coulson, PhD, CFP®, assistant professor in family studies and human services in the College of Human Ecology. Warm congratulations to the team! Kansas State University is the only university to qualify for the competition finals every year since the competition began in 2001. The 2016 Financial Planning Association’s Annual Conference will be held mid-September in Baltimore, Maryland, and K-State expects to once again field a strong team. The challenge is sponsored by the Financial Planning Association, Ameriprise Financial and the Certified Financial Planners Board. 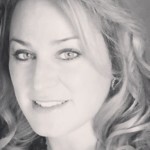 Tierra Dimond is the new PFP program coordinator after Kim Misenhelter’s retirement. Tierra is a Manhattan native, K-State alum and thrilled to be on campus working with students and faculty. Tierra enjoys attending K-State sporting events and performances and says, “I have many great memories of all things K-State since I was a child.” Tierra has two daughters who keep her busy with sports and horseback riding. She enjoys coaching their teams when she can, participating in outdoor activities and traveling. Helping students achieve their educational goals from a support position as well as working with K-State alumni are the things she most looks forward to in her new position as program coordinator. Health and financial resources may be two of the most important resources when individuals experience stress. As one of the most commonly cited theories in the organizational behavior literature over the last 25 years (Halbeslegen, Paustian-Underdahl and Westman, 2014), the Conservation of Resources (COR) theory was used in this dissertation to view how health and financial resources relate to general life and financial stress. Ann Coulson, PhD, CFP®, assistant professor, received an award in March from K-State Provost April Mason for her long-standing service to the Great Plains Interactive Distance Education Alliance, GPIDEA, and outstanding efforts in tracking student assessment in the family financial planning master’s degree program. Ronald Sages, AEP®, CFP®, CTFA, EA, PhD, assistant professor, received the Faculty Excellence Award through the Great Plains Interactive Distance Education Alliance, GPIDEA, for his contribution to the Case Studies course for graduate students in the Personal Financial Planning CFP® certificate program.